Photographs courtesy of Walters Gardens, Inc.
Perennial gardens don't have to be so time intensive if you choose to grow at least a few varieties that require little watering, fertilizer, staking, spraying or other maintenance. Let's look at five of the best types of perennials to grow if you're an on-the-go sort of gardener. 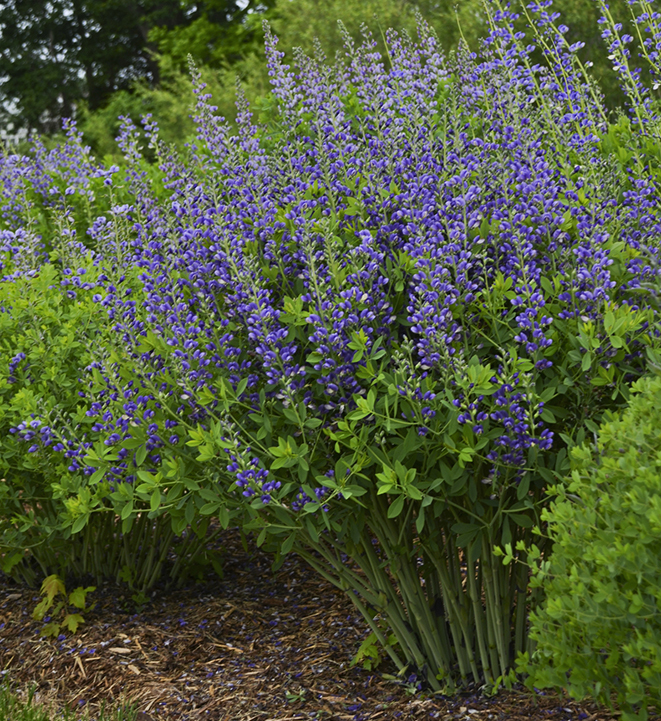 One of the longest-lived perennials native to the American prairies is Baptisia, commonly known as false indigo. While most wild forms are quite tall, the Decadence series brings them down to just 2 ½-3' tall and wide, about the size of a clump of daylilies. Now everyone can have the fun of growing false indigo, even people gardening on smaller city lots. Decadence false indigo is very drought tolerant once established, so you'll only need to provide supplemental water during times of extended drought. It thrives in full sun and hot weather, and does not require fertilizing or deadheading. In fact, if you do cut off the spent blooms, you'll be preventing the formation of its decorative seedpods. So just plant it, then leave it be and it will be fabulous! Zones 4-9. Planting this cultivar of our native false sunflower is an easy way to add a bright splash of gold to your landscape from midsummer into early fall. 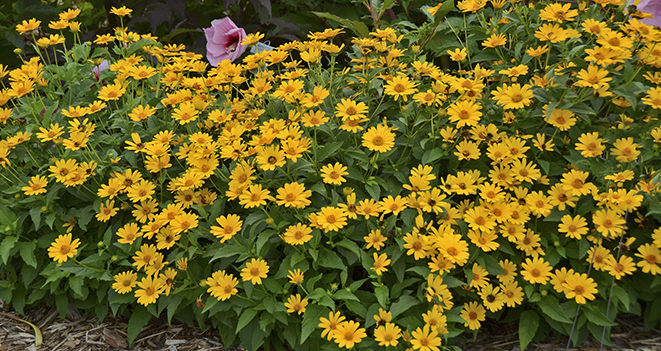 It will give you the same look as a mass of Black-Eyed Susans (Rudbeckia), but with none of the disease issues and it will even rebloom if you trim it back after the first round of flowers finishes. Grow 'Tuscan Sun' in a mostly sunny to lightly shaded spot in ordinary garden soil. It can handle some dryness once it is established, but until then it will need about an inch of water per week. 'Tuscan Sun' is very heat tolerant and is easy to grow across the country in zones 3-9. 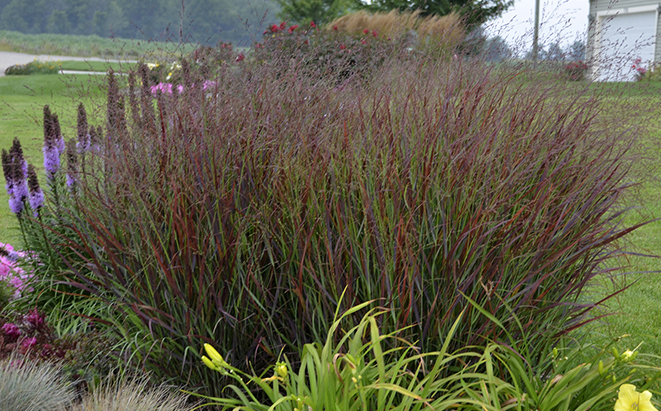 Cultivars of our native switch grasses are some of the easiest ornamental grasses you can grow. These durable perennials will thrive in any soil, from sand to clay, and in any moisture level, from dry to wet. The only thing they require is full sun. Prairie Winds switch grasses can be used as a low maintenance screen, hedge, background planting, or as a focal point in the fall landscape. Once per year in late winter or early spring before the new growth emerges, cut the entire clump of last year's foliage back with hedge trimmers and compost it. Beyond that, no other maintenance is necessary. When you feel its succulent leaves, you'll see why Rock 'N Grow stonecrop is so drought tolerant. It stores water in its foliage and stems as a reserve, and usually doesn't require supplemental water once the roots are established. Plant it in full sun and very well-drained soil, and do not add fertilizer or organic matter when you plant it. Lean and mean is how Sedum rolls--pamper it and you'll be disappointed. Sedum comes in many sizes, shapes and colors. The Rock 'N Grow collection includes both upright mounded and low spreading types that are hardy in zones 3-9. Expect them all to bloom in late summer and fall, providing a late season pollen source for bees and butterflies. Leave it alone in fall and then cut any remaining foliage down to the ground in early spring. During the hottest months of summer, the cool blue flowers of Russian sage are a welcome respite in the garden. While older varieties grew much too large for most garden spaces, anyone can fit 'Denim 'n Lace' in their garden. Its mature size is about 2 ½' tall and 3' wide. You'll love how it forms a more dense, upright clump and is completely covered in flowers beginning in midsummer. 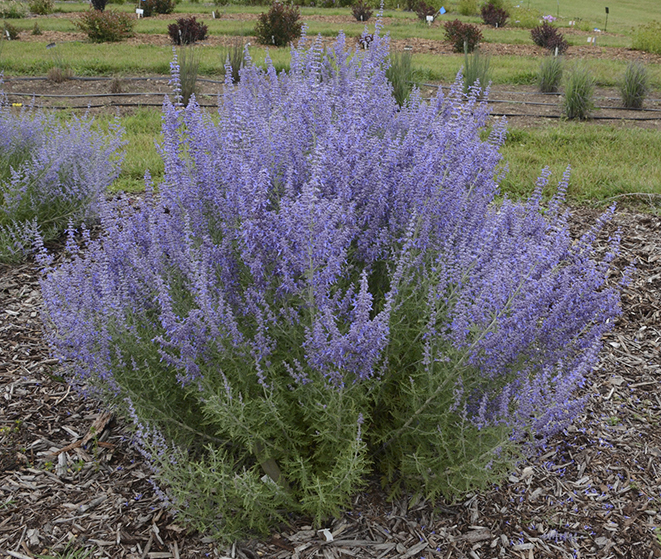 Like sedum, Russian sage is not a plant that enjoys pampering. Grow it in very well-drained, sandy or rocky soil and do not add fertilizer or organic matter when planting it. It enjoys drier soils and rarely requires supplemental water. The only maintenance it should need is cutting the stems back to about 3" tall in early spring before new growth appears. Search for more Proven Winners® Perennials at www.provenwinners.com.